William E Solander is a first-chair trial lawyer who understands the importance of knowing his cases intimately. For pharmaceutical clients, as well as those in other industries, he brings a hands-on style to high-stakes patent disputes, with particularly deep experience in Abbreviated New Drug Application litigation. Mentored by the renowned patent litigator Robert Baechtold until his retirement, Mr Solander has earned his own “fantastic reputation” as “a truly excellent patent litigator” (Chambers USA). 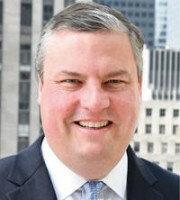 He has led cases involving subject matter as varied as prescription antiarrhythmic drugs, protein synthesis, new battery technologies and prescription sleep aids, and he has secured victories in an equally wide variety of forums, including federal district and appellate courts, the Patent Trial and Appeal Board and civil arbitrations. Mr Solander has also developed a significant knowledge of IP laws and civil justice systems outside the United States, and frequently counsels clients who seek his strategic advice in connection with business and legal activities in foreign jurisdictions. He has been involved with trial teams on litigation in Australia, Canada, Germany, Israel and the United Kingdom, among others. Mr Solander speaks and writes frequently on litigation strategy, polymorph patents and Hatch-Waxman litigation. “[E]merging as a leader in the pharma field” (Chambers USA 2015). “William Solander is highly intelligent, always reachable, and has excellent communication skills. He is an outstanding lawyer, is flexible and adaptable, and has the clients business in focus” (Best Lawyers in America 2014). “Bill Solander is an insightful patent litigator with sound judgment who is capable of achieving effective results when solving legal and business issues” (Best Lawyers in America 2014).